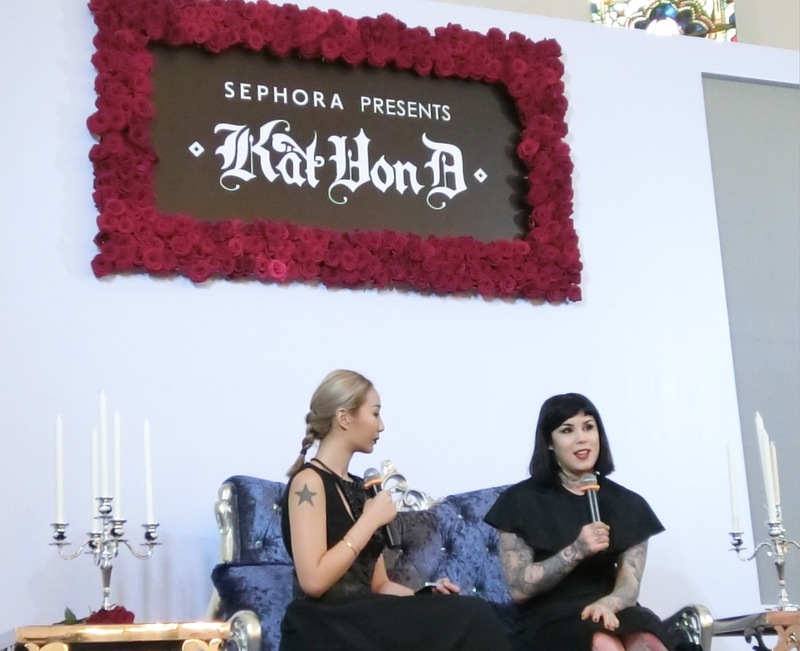 Earlier last month, we shared that Kat Von D might be coming to Singapore stores. Sephora Singapore has since confirmed the launch, and the American label will be hitting its stores in July, and on Sephora.sg. Prices start from S$31 for the Kat Von D Everlasting Liquid Lipstick to S$73 for the Kat Von D Shade + Light Contour Palette. At the launch preview held at Chijmes last week, Ms Von D made an appearance and shared her thoughts on the concept of beauty. How do you balance having a successful makeup line and your tattoo shop? I find a lot of joy and happiness in being able to create and making ideas come true in a tangible state where you can hold something in your hand. It is a really awesome thing. I don’t know what it is like to take a vacation, or work cause everyday is a dream. That is what happens when you love what you do. When did you first discover your love for make-up? I have always loved makeup, I started wearing it when I was way too young, maybe 12. My fascinations with makeup started when I got into punk-rock music. I was not so much influenced aesthetically by other people and the bands, than by the free spiritedness. Right now, it is a really exciting time for makeup. For back then, black lipstick was something you might wear for Halloween. Now, it is very embraced by the editorial world and beauty fans like me. That is really exciting, we could wear blue lipstick or purple lipstick and not be judged or feel weird about expressing ourselves. And that, ultimately is what makeup is about. You can’t take it so seriously, it is one of the few perks in life. So have fun with it. What was the first makeup product you owned? Liquid liner. I just remember thinking when I was putting it on, that it was life-changing in a way. It wasn’t that I liked myself better with make-up but I thought wow, I had no idea I could do this. With make-up, it is all about how it makes you feel. I know that when I’m wearing red lipstick, it is going to change my demeanour. I love myself without makeup the most, that is my favourite look of all time. I think there is nothing brave about it at all, it is just about being honest. But I also love wearing makeup. I’m not one of those people who think that you can only be beautiful without makeup. How long does it take for you to put on a full-face of make-up? It depends on how intricate I want to go. On average, about 15 to 30 mins. But I can also create a whole look in two minutes at the back of a taxi cab. Just give me an eyeliner. I’ve had alot of practice. Which do you decide on first? Outfit or makeup? That’s what I love about makeup. You could be inspired by whatever mood you are in. I could buy a nail polish and that dictates the rest of the look. Sometimes my makeup reflects my emotions. Artistry and makeup is all about self-expression. Fashion and haircuts are all the same thing. Is there a makeup look that you would never wear? There are some colours that are not flattering on my skin. But I am not scared to experiment. I mean come on, I have stars tattooed on my face. Most of my favourite style icons are dead, like Edith Piaf, the classic beauties. I am in love with that spirit where the icons owned their look. But I am more inspired by eras and decades; versus people. For fashion, I like everything from the Victorian times to the 1940s. What are your thoughts on permanent make-up, such as tattooed brows, eyeliner and lipstick, which are popular in Asia? You guys are crazy! This was also a trend in the States for a bit. I think go for whatever makes you happy. But you should never let trends dictate what you look like. I am tempted to urge people to not follow this trend. Because one of the beautiful things about makeup is that it is always changing, and evolving. For examples, the popular shape of the brow changes with every decade. And you don’t want to look dated with a tattooed brow. I’ve been a tattoo artist for two decades now, it took me 10 years to master the art of tattooing to a certain degree. And when I look at what it takes to get a cosmetologist license…in America, it is two weeks. I am not saying that all people who do permanent cosmetology don’t have experience, but I suggest to always do your research first. And the cool thing about my makeup is that it is so pigmented, and if you do have tattooed makeup on, you can cover it right up with my products. So why do you have products that cover up tattoos? Years ago, when I launched the tattoo concealer product, I got alot of slack from my tattoo artist friends who asked me why would I do that. But I think that everyone should have the freedom to have their tattoos covered. When I ask my makeup artist friends what is the biggest request they have from clients, it is often about people wanting to cover up their tattoos for their wedding, or a job interview, or meeting their parents and don’t want them to think that they are in a gang, or whatever. There are professional products to cover up tattoos but they are not the easiest to use. So I wanted a product that exceeds expectations, and is easy to use. I am also launching the complementary Lock-It concealer in September. What do you love most about Kat Von D the brand? I am so proud of it. I started the collection with four shades of lipstick, and it has grown to be so much bigger now. I never dreamed in a million years that I would have a makeup line…There is not one aspect of it that I am not proud of. It takes nothing for somebody with status to slap their name on a product and collect the pay check. For me, I have no interest in doing that. I just want to make things that I am proud of, and when I look at it, I go that’s my baby, I created that. I truly poured all my heart and soul into it so I hope that translates into my products. It is hard to pick. I can’t live without red lipstick, and my foundation, and the contouring products. Collect them all. What does makeup artistry mean to you? I have a hard time with the word “art”, “artist” and labels…People know me for my success from TV shows like LA Ink and Miami Ink, but I won’t call myself a tattoo artist. That is just one thing in a long list that I am able to do, but that is what I am known for. When I started my makeup line, my intention was to create a line that would stand alone. You won’t have to know me or even like me to love the products. And I think we have been successful with that because there have been times when I am at the airport and people are like, are you the makeup artist? I am not a makeup artist, but I consider myself a makeup fan. During my creative process, I would be so lost if I haven’t had so much help from my makeup artist friends and creative team.